Excitement is mounting about the total solar eclipse that will pass over the United States this August on a path from Oregon to South Carolina. In Connecticut, although the eclipse will be partial, there is still quite a lot of enthusiasm. Some public libraries in the state have had special protective eyeglasses, donated by the Space Science Institute, to give away to those who want to view the eclipse. Others are holding eclipse-watching parties. Safety is a big concern. That was also true one hundred years ago. A partial solar eclipse traveling on the same path passed over the United States in June 1918, but according to the Norwich Bulletin, the only protection available for viewers was smoked glass and it was “in demand”( June 10, 1918, p. 5). Smoked glass had long been a popular, though not really effective, popular remedy for avoiding blindness while looking at the sun. In 1919, the Bridgeport Times and Evening Farmer reprinted a story from half a century earlier, suggesting that as the 1869 eclipse approached, policeman were suspected of failing to clean the globes of the street lights in order to boost the supply of glass for viewing! (June 4, 1869 as reprinted in June 4, 1919, p.6). Medical men in 1918 were anticipating the opportunity “to study the pathologic effects of exposure to intense sunlight” that was created by each eclipse. According to Dr. L. D. Dunlap, after an eclipse visible in Northern Europe in April of 1912, there were “more than twenty papers published in ophthalmic journals.” One such study documented 3,500 cases of eclipse blinding just in Germany. Dunlap wrote to the papers urging that a massive public education campaign begin as soon as possible (Bismarck Daily Tribune, June 7, 1918, p.8). Despite the dangers, the newspapers announced the viewing schedule for each community. The Norwich Bulletin, for example, told its readers that the June 8 eclipse “. . . will be visible in Norwich as partial. It will begin here at 5.31 in the afternoon and end at 8.15 daylight saving time. The greatest obscuration will be at 6.27 o’clock” (April 26, 1918, p. 9). The Bulletin also followed up with gossip about the viewing parties in Norwich, Willimantic, Danielson and Thompson. In Putnam “Thousands of observers watched late Saturday the partial eclipse of the Sun…” (June 10, 1918, p. 6). The Bridgeport Times and Evening farmer added a touch of humor. Astronomy students, it joked on May 28, 1918, “don’t seem to be much interested in the eclipse.” Apparently “It takes a dark night and the right company to make astronomy interesting.” By mid-month, the word “eclipse” had entered into journalistic vocabulary and began to be used to describe a wealth of phenomena. Not surprisingly, as the world war was impossible to forget, the Times and Evening Farmer soon tied in the related activity of food production. It announced “A total eclipse of the potato bug is due … The agricultural committee of the chamber of commerce will pay fifty cents a pint for all pests presented”(June 13, 1918, p. 5). Dunap, L. G. “Wholesale Blinding May Follow Carelessness in Viewing Total Eclipse of Sun with Naked Eye,” Bismarck Tribune, June 7, 1918. Accessed on Aug. 10, 2017 at http://chroniclingamerica.loc.gov/lccn/sn85042243/1918-06-07/ed-1/seq-8/. 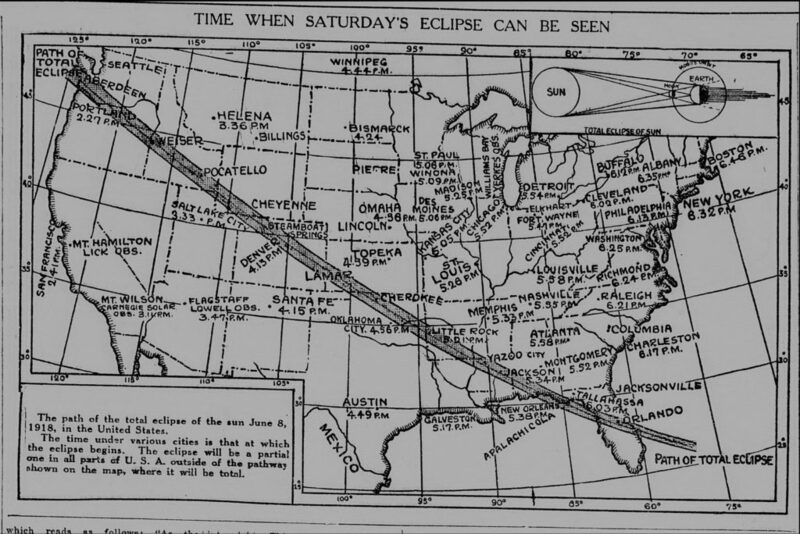 “Eclipse of Sun Tomorrow Will Be Visible in the United States,” Bridgeport Evening Farmer, April 16, 1912, p. 6. Accessed on August 10, 2017 at http://chroniclingamerica.loc.gov/lccn/sn84022472/1912-04-16/ed-1/seq-6/. “How to Tell If Your Eclipse Glasses or Hand Held Viewers Are Safe,” American Astronomical Society. Accessed Aug. 9, 2017 at https://eclipse.aas.org/eye-safety/iso-certification. “Looking Back Fifty Years,” Bridgeport Times and Evening Farmer, June 4, 1919. See paragraph “There is a rumor. . . ” Accessed August 10, 2017 at http://chroniclingamerica.loc.gov/lccn/sn92051227/1919-06-04/ed-1/seq-6/. Mathewson, Samantha. “2 Million Free Eclipse Glasses Coming to US Libraries,” June 26, 2017, Space.com. Accessed on Aug. 9, 2017 at https://www.space.com/37310-public-libraries-give-away-eclipse-glasses.html. “Total Eclipse of Potato Bug,” Bridgeport Times and Evening Farmer,, June 13, 1918, p. 5. Accessed on Aug. 10, 2017 at http://chroniclingamerica.loc.gov/lccn/sn92051227/1918-06-13/ed-1/seq-5/. “Sun in Eclipse Here on June 8,” Norwich Bulletin, April 26, 1918, p. 9. Accessed on August 10, 2017 at http://chroniclingamerica.loc.gov/lccn/sn82014086/1918-04-26/ed-1/seq-9/. “A Total Eclipse of the Sun – Today in History: January 24” Connecticut History.org. Accessed on Aug. 9, 2017 at https://connecticuthistory.org/a-total-eclipse-of-the-sun-today-in-history/. Includes a photograph of the June 24, 1925 total eclipse of the sun visible in Connecticut. “Total Eclipse Visible in Connecticut,” Connecticut Historical Society Museum & Library, January 28, 2014. Accessed on Aug. 9, 2017 at https://chs.org/2014/01/total-eclipse-visible-in-connecticut/.